Thank you to the American Dairy Board North East for partnering with me on this post. If you love this sous vide recipe you are going to want to try my sous vide cheesecake recipe, how to make sous vide mascarpone cheese as well as how to make homemade clotted cream. By using the sous vide cooking method you are ensured that the custard of the creme brulee does not curdle, crack or dry out. The precession of the temperature of the water will cook the dairy ingredients to a smooth, consistent custard that is a challenge to achieve with the traditional oven baking technique. New to sous vide? I explain in simple terms everything I know about sous vide cooking. 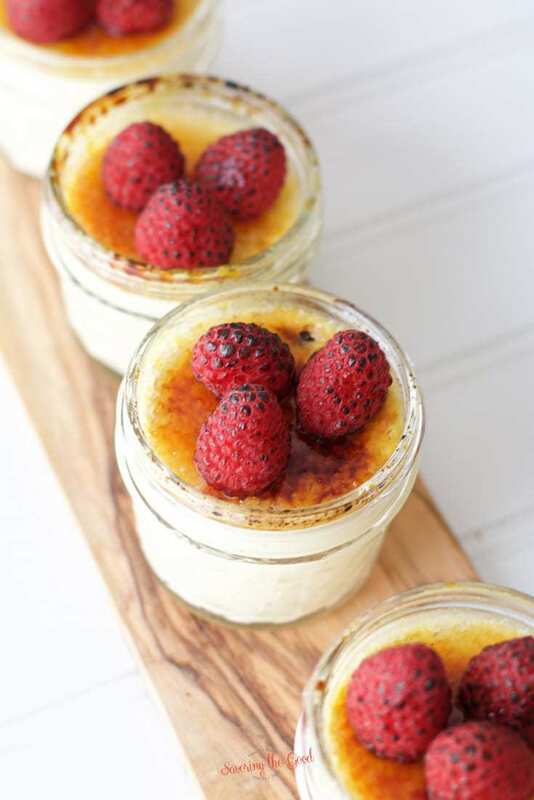 Creme brulee is a creamy custard with simple ingredients. Combine heavy cream, egg yolks sugar and a flavoring of your choice and gently cook in a moisture filled environment for the smoothest, silkiest custard ever. The brulee is crunchy caramelized sugar topping. The combination of the rich custard with the crunch and sweetness of the sugar brulee is a treat for your mouth. ** Whisking the ingredients until smooth is also an option if an immersion blender is not available. Just be sure the ingredients are well combined. What month is Dairy month? June is dairy month and was started back in 1937 when grocers wanted to encourage purchasing of milk as the months were starting to get warmer. Happy cows mean more milk and more milk means there is cause for a month long celebration of all things dairy. What type of bedding do dairy cows sleep on? When cows are comfortable they produce more milk so the American Dairy Farmers NE farms want their girls to be as comfortable as possible. I have been on farms where the cows are lounging on water beds. That is right, water beds. These farms have reported that some of the cows don’t want to get up to be milked, they are so comfortable. Another option is sand bedding. Just like lounging on the beach, the cows are able to sift and shuffle to make the sand adjust to the curves of her body. Don’t forget about recycled bedding. When you send your newspaper to recycling, it might just end up under a cow as her bedding! By using recycled paper there is less waste in the land fills, the paper is further composted and spread on farm fields. Learn further details in this article by Ania Stilwell at the American Dairy Association, North East. Whether you buy an organic brand that has labels stating, “No Antibiotics” or regular wholesome milk–ALL MILK IS ANTIBIOTIC FREE. Before the milk tanker leaves the farm it and its contents are fully tests and if there is any antibiotics found the tank is immediately dumped and the tanker leaves empty. I did a dairy farm tour in New York state and we asked the farmer how many times that has happened to him and he said that in 45 years of him on that farm it happened once. Once they had to dump a tanker. The milk never left the property. Are dairy farms run by big corporations? Did you know that 97% of dairy farms in America are family owned and operated? Every family member from the adults to the children have a role to make the dairy farm a success. Dairy farming is not only their job but it is their way of life. Milking and caring for the dairy herd is a 24/7/365 job. For more information about family farming in America read this article by Michelle Barber. In a large bowl, combine the heavy cream, egg yolks, sugar and seeds of the vanilla bean*. 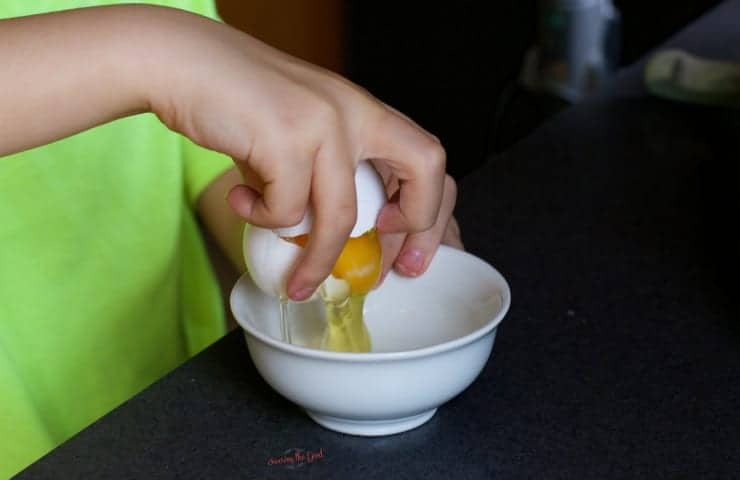 Strain the egg and cream mixture to help disperse any air bubbles. Slowly pour into 4 ounce mason jars stopping just before the threads on the jar. Allow to rest for 20-30 minutes or until the majority of the bubbles have popped. This step can be skipped but to ensure a silky smooth top to your creme brulee for the sugar to be caramelized on, I highly suggest resting the cups. Place a lid and a ring on the mason jar and finger tighten. Submerge in the heated sous vide and cook for 1 hour. Remove from the water bath and allow to rest on the counter until cool to the touch. Once the jars are cool, completely cool them down in an ice water bath. Once completely cool, remove from the ice water bath and store in the refrigerator until ready for brulee. How do you get the sugar to caramelize on creme brulee? There are different ways you can get the sugar to caramelize on creme brulee. When I was in the culinary industry, twenty years ago, we would caramelize the sugars under a salamander or a broiler. I was never happy with the lack of control of the flame so using a kitchen blowtorch has become my preferred method. 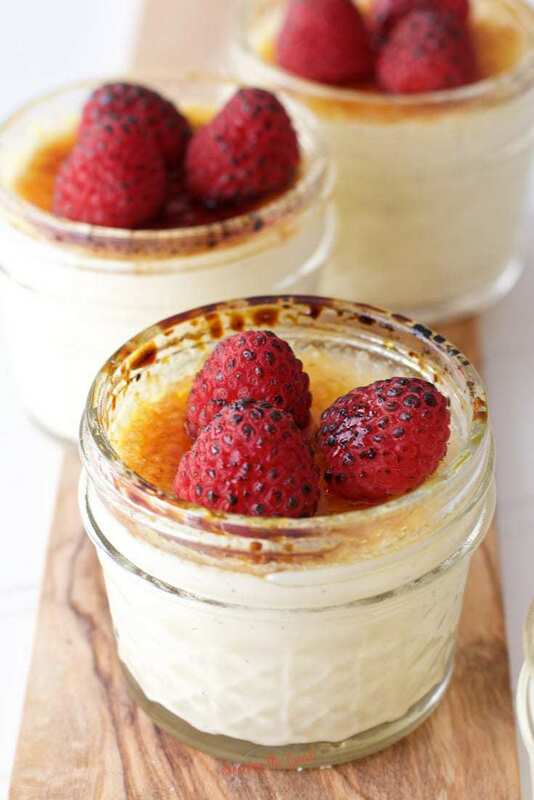 Open the creme brulee jars and use a dry paper towel to absorb any condensation off the top of the custard. Sprinkle a thin layer of granular sugar over the custard. Using a kitchen torch with a sweeping motion bring the flame 10-20 inches away from the sugar. Sweep back and forth until you see the sugar start to melt. As the sugar starts to melt, add a second layer of sugar and repeat. This can be repeated as many times as you like. The more sugar layers, the crunchier the topping will be. Allow to rest and cool for optimal cracking. This is optional but makes for a lovely presentation. The taste of the torched raspberries compliments the caramelized sugar with a smokiness of a campfire. Warm and sweet pairs lovely with the crunch of the sugar and the creaminess of the creme. Place fresh raspberries on a heat safe surface such as a cookie sheet. With a sweeping, circling motion, torch the raspberries until they take on color. Allow to cool to the touch and place on the creme brulee. Is creme brulee gluten free? If you are looking for a gluten free dessert, creme brulee is for you! This recipe for creme brulee is gluten free. This dairy dessert is full of protein from the heavy cream. Creme brulee is one of my favorite desserts! This recipe looks amazing! Me too! And this recipe is so easy!